The Washington Post will publish around 1,200 stories today, yes, that’s right, 1,200 stories just today. The volume of content articles being published each day continues to grow and is far beyond our ability to consume all this content. Thus we have to find ways to filter and decide what to read. Content curation is playing an increasingly important role in this filtering process, saving us time and helping us staying updated. Content curators are becoming the heroes of the modern internet. 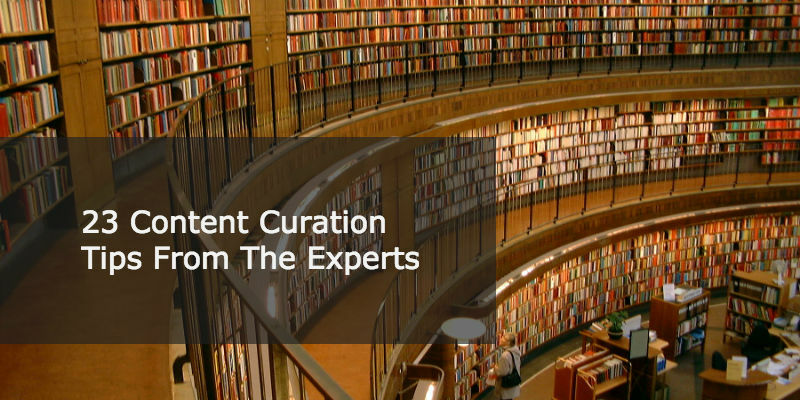 These curation experts are emerging from different fields such as knowledge management, social learning and marketing; and they are establishing a set of best practice guidelines. We have been collecting and curating the best advice and tips shared by many of these experts. Here is our summary of top tips from the experts, with links to the original advice for further reading. The interest in curation, and specifically content curation, has grown over the last 5-8 years as we can see from Google trends below. In our view a good content curator is a thought leader: someone who is well read, seeks the latest information, evaluates and reflects across developments and news. Someone who highlights the more valuable and relevant content adding context and their own perspective. However, there is much more to being a good curator. To help you raise your curation game here are 23 tips from experts and practitioners in the field. If you don’t have the time to read this post right now but you want to stay on top of content curation, check out this Content Curation Briefing made by Robin Good. It is updated with fresh content every few hours. Content strategist Tiffany Monhollon recommends thinking deeply about your intended audience and determine what topics and content would be most relevant for them. “It’s important to start with your audience in mind. What topics and content formats that relate to your business will they find meaningful?” Is it industry trends and statistics, practical tips and how-to posts, case studies or the latest news such as product launches or acquisitions? Relevance is king in curation. Know your audience and curate what they care about. This is a really powerful point. Curation like content is about building and engaging with your audience. It’s not about what you think is valuable – it’s what the community values. Thus you need to determine whether the content you are curating is relevant and helpful to your audience, and refine. Ideally you want to elicit feedback on the content, make it easy for them to comment, discuss or simply upvote. This engagement will give you a much better sense of what curation that is working. It is important to provide context, you can also voice an opinion, as part of adding value to the content. It’s not just what you share, it’s why you’ve chosen to share it. Marissa, Growth Manager for UpContent, also stresses the importance of engagement. She recommends that you use curation as a springboard for discussions with your audience. If you share a post, ask questions and provoke a discussion around the content. Also jump into relevant conversations. Good curation is a conversation, not just broadcast. Paul Chaney points out the value of curation in communicating industry news and trends. If you are on top of the latest news in your industry and communicate relevant news and trends you can become a trusted source for industry news. Everyone appreciates good industry news curators as they provide a valuable service saving other people time. Aaron highlights the potential power of curating images. People love images. There are many ways to curate images and Aaron highlights the way brands capitalise on image curation by using the photos taken by their customers while using their product. Stephen, one of the Anders Pink founders and author of the AP Friday Briefing, focuses on the importance of saving people time. A survey by Towards Maturity found that two thirds of leaders say that they struggle with finding the time to learn, and 44% can’t find what they need. The IDC estimates that the average knowledge worker spends 9.5 hours a week searching for information. A good curator can save people significant time if they provide context and commentary to content and links. That may be all the reader needs at this point in time. They can be aware without reading the full post and read that later. This is one of the reasons that curation is such a powerful process, in what other areas can you actively save time for people and make them more productive? In the same way that content marketing is about building an audience over time with consistent content, so good curators build an audience through regular curation. It is not good enough to curate content for a few months and then take a break. You are responsible for keeping it relevant, fresh and engaging, so people keep coming back. Therefore think about the time you can commit and how much you can curate before you start your curation, it is not a project it is something you do continually. One of the key benefits of content curation is that you save the reader time in having to search the web. However, they will rely on you to review and draw on a wide range of sources. Thus Matthew emphasises the importance of curating from a broad range of sites and sources. This is also why our keyword searches on Anders Pink search across every website, though you can limit and search just a selection of say 20 sites if you prefer. However, the more you limit your sources the more you may miss something. This is why we don’t restrict our Anders Pink keyword searches to any specific domains or RSS feed, we’ll bring you the most recent and relevant content from any source. So if Scientific American just shared an article about Content Marketing, you can be the first to find it – because others curating that subject are less likely to find it. You may have to skim through a few more articles if you use wider sources but you can also uncover some gems. 15 minutes twice a day seeking – finding new content that may be worth curating. If that seems daunting, think about how tools can help you…. Adam Monago highlights the importance of using tools to help find and filter content to curate. Tools can include RSS readers, Twitter lists, Scoop.it and tools like Pocket to save content to read later. We would also suggest Anders Pink as an all in one tool, where you can use a combination of RSS feeds, Twitter lists, domains and keyword searches to filter and find content in your area. We will find and aggregate content for you on any topic to reduce your time searching and enable you to spend more time evaluating content. Steve Rosenbaum highlights the importance of curation in the content value chain. “Creators, distributors, aggregators, and curators are all economically essential parts of the value chain.” There is so much noise and content that there is a need for aggregators and curators. You will not visit hundreds of sites to find the content you want but through the use of aggregators and curators you can filter content effectively from a wide range of sources. Erik, Social Media Manager and Social Media Examiner uses a private list of people who are good curators on Twitter. Thus he can then review what the curators are sharing on Twitter. You can also do this on Anders Pink by simply entering the Twitter handles of good curators and AP will bring together all the content they are sharing. Here is an example of what SEO gurus are currently sharing on Twitter. You can also filter this content by keyword if you want. Twitter is likely to be one of your main curation sources. But the more people you follow, the more noise in your feed. Jane Hart recommends you actively review what they’ve shared in the last 2 weeks. Was it relevant to your professional interests? Was it useful? If not, it’s time to drop them to let you focus on others. You can always add them back if you miss them. Azzam recommends developing influencer relationships to help you create curated content. You can actively seek input from influencers into curated posts. Lee Odden is a great example in how he works with influencers. He builds relationships with experts in marketing and then gathers and curates their input into posts that examine specific issues facing the industry. One of the potential issues with content curation is that you are driving users to someone else’s site. So if you share a specific post on social networks the user goes to their site not yours. Derric Haynie has a neat solution for this. He recommends you use Rebrandly for link retargeting. Rebrandly is an advanced URL shortener and anytime someone clicks on a link set up via Rebrandly to go to someone else’s site, they will be added to your custom audience as if they had visited your own. Thus you can include this audience in your retargeted ads. Also if people clicked on the link from Twitter, you can run Twitter retargeting ads, if Facebook you can run Facebook ads. Heidi Cohen makes the important point that “content curation gives credit where credit is due.” You should always let your readers know who created the content and link to them. We also agree with Heidi when she says she strongly disapproves of content curation tools capturing and displaying full articles using inline frames or in apps, without prior consent. Marc Rosenberg makes the valid point that we find it easier to add and publish content than we do to remove old or outdated content. He recommends regularly reviewing and removing old content. At AP we remove old articles from briefings automatically but if you save something it is in your saved board forever unless you remove it. Time for some spring cleaning? Bonus tip, number 24, I knew we couldn’t stop at 23. Finally Brittany makes the point that with all this curation you are doing you probably know a lot about the topic at hand. Thus do regularly create your own original content for your audience. What did we miss? Let us know, this is still an emerging skillset and there are many more great tips out there. If you want to stay on top of content curation, here’s a great Content Curation Briefing made by Robin Good on Anders Pink. We crawl millions of sites and update the briefing with fresh content every few hours. You can also use our API to display your briefings and curations on any site. Here is how you can use our content curation plugin for Moodle, to display briefings directly within any course and deliver, fresh new content every day. Curate content faster with a briefing on any topic you want – sign up for free here.